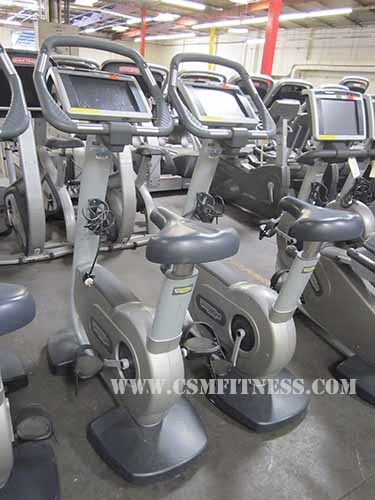 The Tehnogym EXC700ip upright bike is a new updated model that replicates the sensation of riding a real road bike. It is biomechanic and ergonomic design to offer a variety of positions to improve comfort, accessibility and performance. The EXC 700ip also has new pedals with adjustable straps to provide stability and support for the user as well as its exclusive handlebars that support the elbows for maximum comfort. It also has the Fast Track Control that allows the user to adjust the intensity level without having to interact with the keypad or change training position. In addition to the features, it has 23 workout programs, 25 intensity levels and 13 languages. Maximum user weight: 397 lbs.